News Melbourne & other "EUREKA"
New Sardegna/Australia Bilateral Student Exchange coming soon! After approximately 19 months of consultation, the SCA is continuing discussions with the aim of establishing a formal long term"Sardegna/Australia Bilateral Student Exchange" Agreement with Marcellin College (Bulleen) and a Cagliari based school, "Il Convito Nazionale di Cagliari". It is expected that this agreement will be finalised and signed in time for the SCA 2/2018 AGM, at which specific details will be provided. Paul Lostia SCA President, confirms that in a recent meeting the Principal of Marcellin, Mark Murphy expressed his appreciation, and thanked the SCA for having approached Marcellin on this matter, as well as complimenting the SCA for the nature of the initiative. Paul, who is extremely excited and proud by the prospects of this initiative, acknowledges the diligent hard work of the 'Working Group", comprising Alfio Camarda & John DiNatale (Marcellin), Angelo Ledda & Mariangela Prib (SCA), with valuable input from the SCA's Ylenia Useli, and Cagliari based Aldo Aledda, which has enabled the extensive preparatory work to run smoothly. The details of the new program will be officially released after the agreement is signed. Finally, Paul states, "as they say they say in the Classics Watch this space!" 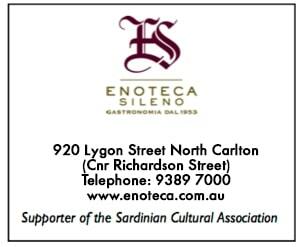 Sardinian Cultural Association Melbourne: The Sardinian Cultural Association (SCA) was founded in 1987 and since 1988 has been officially recognized by the Autonomous Region of Sardinia (RAS). Currently the SCA has a base of around 300 Members, 'simpatizzanti' and 'Next Generation' members and calls Australia 'home' whilst at the same time being extremely proud of its Sardinian heritage. Sardinian Cultural Association (Vic) Inc.